Surface Your Outdoor Spaces with the Right Materials – And Floor Your Guests! 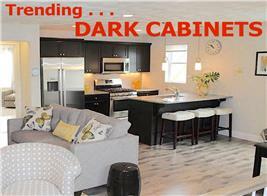 It’s easy to become overwhelmed with the endless choices that come with building your dream home from the ground up. Everything from what type of roof to install to the options for siding your home’s exterior is a constant battle of pros versus cons when deciding on the best materials for your new home. 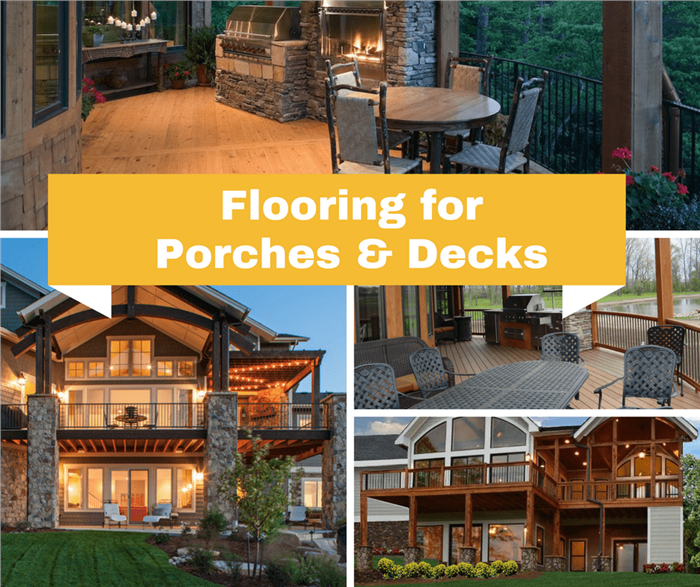 When it comes to the porch flooring the decking of your new-construction home – or one you’re replacing or adding to an existing house – there are a variety of material and size options, depending on your individual needs and aesthetic tastes. 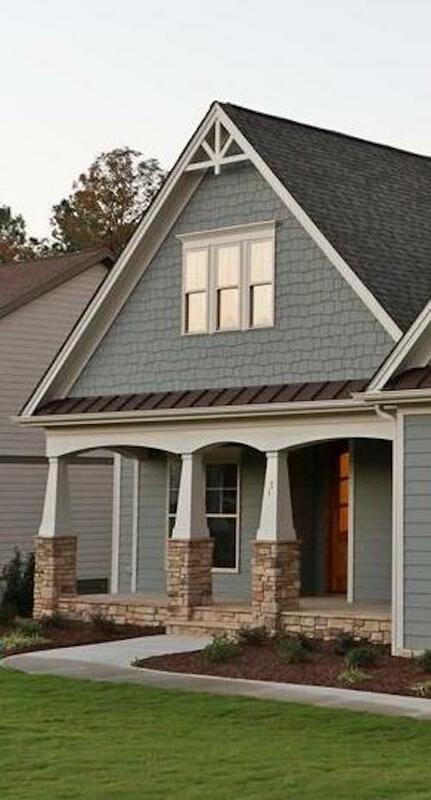 If you’re building your home on a slab or other foundation that is only one, two, or three steps off the ground, you may choose to make your front porch from concrete. This is a good, permanent structure that will likely last the life of your house. 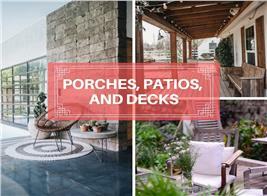 In the back, you may choose a concrete patio or a wood deck. 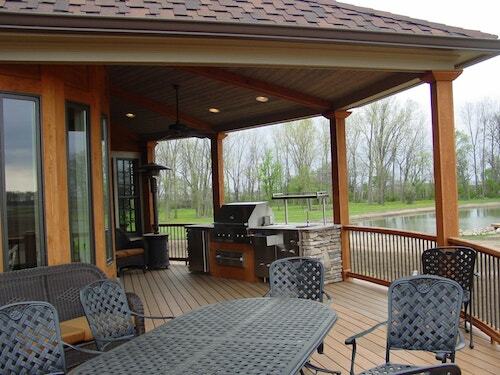 If you’re short of funds, it’s always easy to add a deck – even a covered deck – at a later date. If the home is over a basement and is four or steps off the ground, you will likely choose to build a wooden porch. 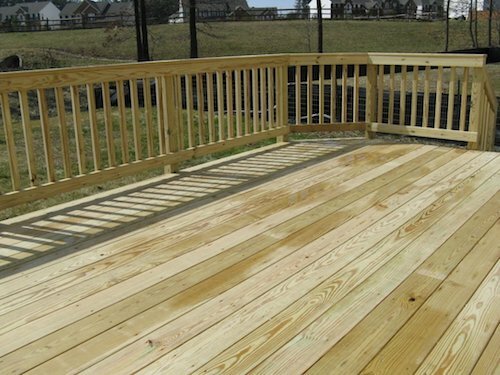 If so – and if you’re building a wooden deck – what type of porch or deck floor will work best for you? At only two steps up from ground level, this front porch on a 3-bedroom, 2-bath Craftsman style country home is constructed of concrete. Front porches that are higher off the ground are typically built of wood and traditionally have wood flooring that is 4 in. or less wide installed perpendicular to the length of the house (House Plan #104-1064). The most popular and common choice for a porch or deck floor is the classic wood option. The beauty of this material is that it comes from nature and is renewable, strong, and fairly easy to use in the construction of your new porch or deck. A big negative to using natural wood is that it weathers quite easily. It can turn a gray color from exposure to the elements and often needs to be cleaned or stained every few years to maintain its natural appearance. But it’s a great option for those seeking a classic look and don’t mind a little ongoing maintenance and upkeep. You might want to consider using conventional untreated lumber like spruce or hemlock for your flooring, but it is not recommended, even for a covered porch or deck that is otherwise exposed to the elements. It will be subject to insect infestation and rot due to weathering and will not last long before it has to be replaced. A better low-cost option is pressure-treated wood. 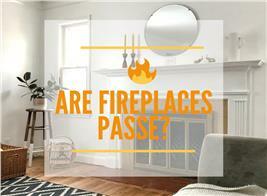 It lasts a minimum of 15 years, usually much longer, and is less expensive compared to its classic wood counterpart. While the pressure-treated wood is often quick to splinter, it is treated with chemicals that help prevent molding, rotting, or termites. And the preservatives used, like copper azole (CA) and alkaline copper quaternary (ACQ), are less toxic than those used in previous generations of pressure-treated wood. This is a great option for those looking for a wood product that is easier to maintain and will remain decay- and insect-free in the long term. 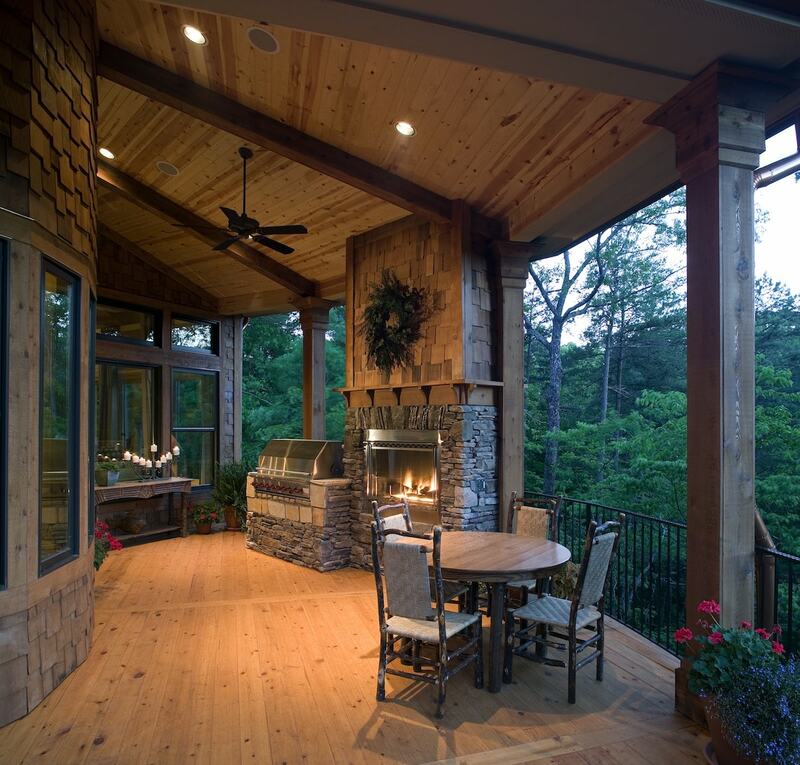 Pressure-treated lumber is perhaps the most popular choice for flooring decks and porches, though it is difficult to find the narrow pressure-treated wood you might want for a front porch (courtesy of Hamshaw Lumber). For those who love the look of classic wood and don’t want something chemically treated but still want the benefits of less maintenance and worry about rot or termites, redwood or cedar might be perfect. Both of these woods last more than 20 years and have natural defenses against mold, rot and termites which make them ideal for the homeowner looking for lower-maintenance upkeep. You can choose from the darker, rich colors of the red cedar and redwood or stick to something light with white cedar, which is harder and water resistant. With any natural wood, the sun will fade the color, so regular upkeep with staining or sun-blocking finishes will be required of the homeowner. 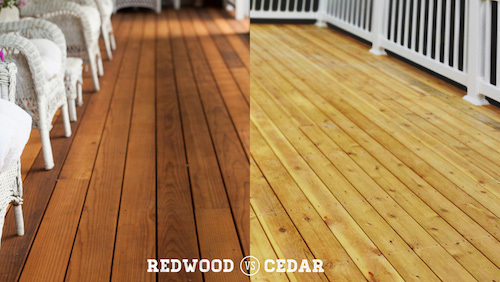 Redwood and cedar are both high-quality materials that look and perform better than pressure-treated wood. 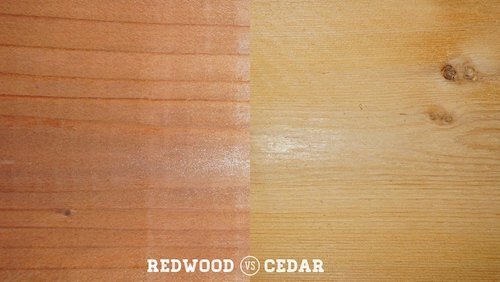 Redwood tends to have a warmer color than cedar (which can be stained to look warmer) and fewer knots unless you pay an exhorbitant premium for clear cedar. Both cedar and redwood can be had in the narower widths appropriate for front porches (courtesy of TimberTown). This beautiful covered rear porch on a 3-bedroom, 2.5-bath Craftsman / Cottage style Ranch home is enchanced by the warm cedar flooring (House Plan #198-1006). If durability is your number-one concert, especially if you live in a climate with lots of rain or moisture, try one of the tropical hardwoods. These harder and denser woods can easily last 25 years or more and are extremely durable and wear well. These wood types are so hard that they often require pre-drilling before you can drive a nail, so using them in construction isn’t for the faint of heart. Another negative, they are quite heavy and expensive, so you may be hesitant to work with this material if you won’t be hiring a professional to build your porch or deck. Be sure that any lumber you use is certified by the Forest Stewardship Council (FSC). This ensures that the lumber has been responsibly harvested from sustainable sources and doesn’t come from old-growth forests, so you won’t be contributing to the deforestation of Earth’s fragile rainforest ecosystem. Tropical hardwoods like ipe, merbau, and red balau are known by many brand names, but they all have a mahogany or teak look about them, are extrememly hard and long-wearing, and last a virtual lifetime against rot and insects (courtesy of JW Lumber). If you’ve decided that you just don’t want to work with natural wood, all of which needs to be treated or stained regularly to keep looking good, you may decide to go with one of the many man-made products available for porch and deck flooring. Composite decking is an excellent choice for a deck like this rear covered porch on a 3-bedroom, 2.5-bath Country style Ranch home plan (House Plan #198-1001). Flooring lumber made from composite material may be your best bet for synthetics. This “wood” is made from a blend of plastic resin and waste wood fibers. It is great for those looking for little to no maintenance because it will never splinter or require treatment. Brands like Trex and TimberTech are immediately recognizable, though there are others. Composite material isn’t quite as sturdy as wood. It will require special framing (with smaller spaces between floor joists), and it will move slightly with time or change in temperature, so you may occasionally see small gaps depending on variables like exposure to sun, time of day, time of year, etc. Also, your builder should use the special materials required to secure it to be sure it performs as well as possible. 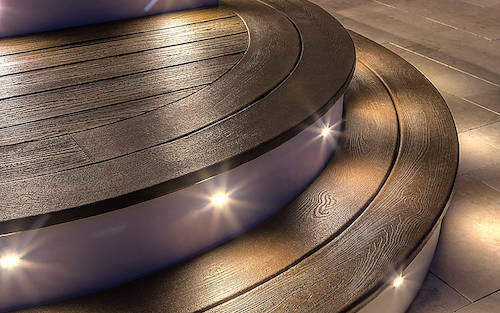 Composite deck flooring, often embossed to really make an impression of natural wood (top), has the advantage of accommodating unusual applications like curves more easily than wood (usually requiring professional installation). The material should be installed with the hardware (bottom) designed for that purpose (both courtesy of Trex). For the most low maintenance option for your deck or patio, there’s also plastic, most commonly available as high-desity polyethylene (HDPE) 0r recycled high-density polyethylen (ReHDPE – essentially recycled milk and other containers) and vinyl, or PVC (polyvinyl chloride). One advantage of polyethylene is that it is made from recyclable (an recylced) materials whereas vinyl is not. 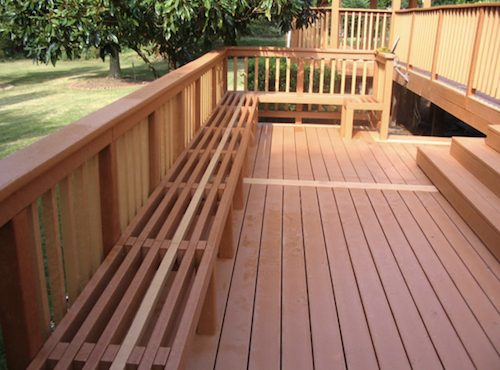 Both polyethylene and vinyl often come in a deck system that your contractor can install, which includes deck boards, rails, spindles, and fascia. You’ll never be required to put a sealer or finish on a plastic deck and the material is absolutely free from potential splintering and cracks. Many of these systems also resist UV rays if they are treated by the manufacturer. Plastic has the same strength shortcomings as composites, so it needs special framing, and it is even more prone to expansion and contraction, so your builder needs to accommodate these needs. Recognizable brands of PVC include Azek and CertainTeed; Tangent and Bear Board are prominent manufactureres of HDPE boards. Oftentimes manufacturers will offer limited lifetime warranties. So, while it doesn’t feel or act quite like wood, plastic is a great option for those looking for the deck of a lifetime … literally. 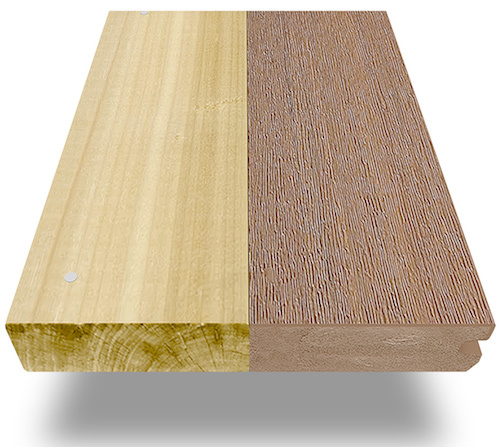 The polyvinyl chloride (PVC) floorboard on the right is compared with a section of pressure-treated lumber (clear with no knots). The PVC board is entirely inorganic and won't rot over time, though it will tend to expand and contract more than wood with changes in temperature (courtesy of Azek Building Products). What Sizes Should I Use? If you’ve already decided on the type of wood you’d like to use for your deck or porch depending on the look you’re after as well as the degree of maintenance you do or don’t want, now it’s time to decide what size board will work best for the construction of your outdoor haven. Some of the common sizes of individual pieces of wood include 2x4, 2x6, 5/4x4, and 5/4x6 inches. Now things get a bit complicated because these dimensions are all called “nominal sizes” because they don’t actually measure out to the numbers indicated. • 5/4x6 is actually 1-1/8 inches by 5-1/2 inches. The options for plank sizes will often be dictated by the type of wood you’re working with, which is important to keep in mind if you’re set on a particular size from the start. • For front porches, it is traditional to use the skinnier, thinner 5/4x4 sizes, placed perpendicular to the length of the house. • For decks, the wider size – or a combination of wide and narrow sizes – is more common, either in the nominal 2- or 5/4-inch thickness. If it’s pressure-treated wood you’re after, you may be limited to the 5/4x6 and all 2-by dimensions. Redwood and cedar woods are sold in most of the standard dimensions with 5/4x6 inches being the most common. Other sizes may just require waiting on a special order. Tropical hardwoods are usually available in the 5/4x4, 5/4x6, and 2x4 sizes. As far as what’s best when it comes to selecting the length of your specified-width wood planks, it often comes down to thickness and minimal cutting. If you select shorter and longer planks, many of which may have to be cut to fit the length of your deck or patio, those cut edges will absorb more water and the excess nails can often split the wood and cause more splintering. 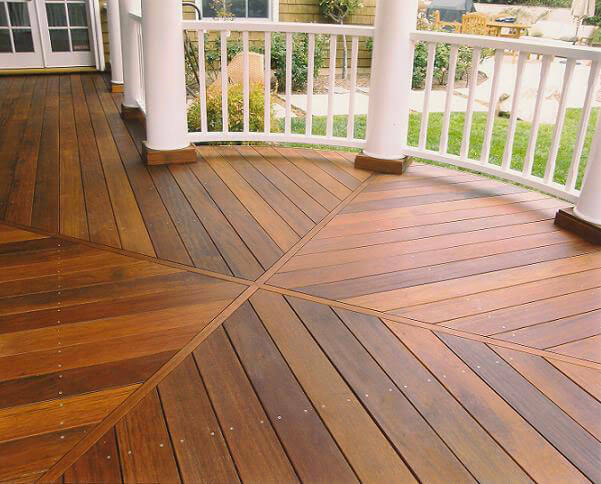 It’s best to select a size that will be as close to the length of your planned deck as possible to minimize cuts ends. Joists spaced 16 inches on center will accommodate both 5/4- and 2-by boards, while joists spaced 24 inches will require 2-by material. 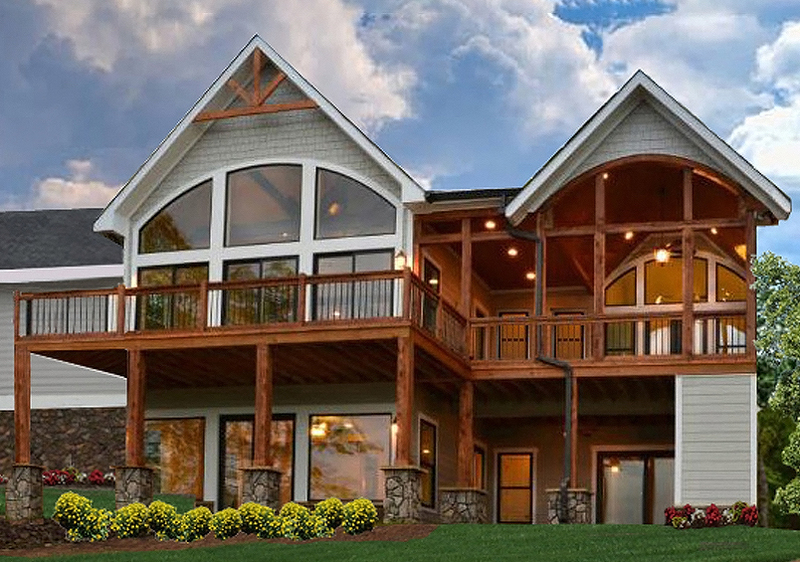 This rear covered porch on a 4-bedroom, 3.5-bath luxury home is decked out in beautiful wood trim and wood flooring: note the 16-in.-on-center floor joists (House Plan #161-1067). 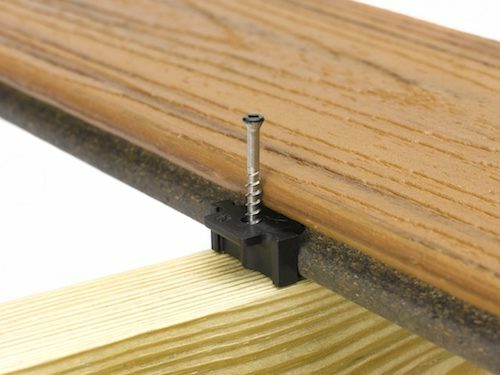 Almost all plastic and composite decking is about 1 inch thick and 5-1/4 inches wide, slightly different from wood products (some HDPE produtcs are pretty much the same dimensions as wood lumber). In general, plastic and composite flooring is not suitable for porches unless you like the look of a wide plank on a porch. Structural framing needs to be able to support these flimsier “boards,” so joists or other support structure must be installed at least 12 inches on center. Length runs should be as long as possible to avoid joints, though they may not always be able to be avoided. This high-density-polyethylene (HDPE) decking, like other other composite and plastic flooring, looks good on a deck, but it doesn't come in the dimensions one would want for a classic-looking front porch floor, 5/4x4 set perpendicular to the length of the house (courtesy of Bear Board Engineered Plastic Systems, LLC). Like many of the options for your new-construction home, decisions in planning your outdoor space most often come down to personal preference. 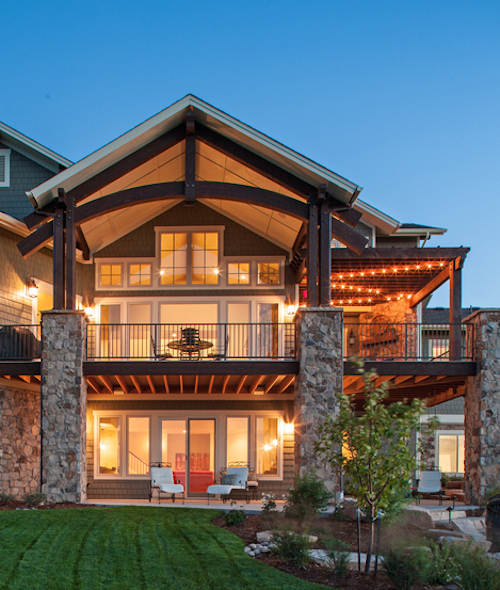 While there is no one “best” option for the materials used in your new home’s porch or deck, there are plenty of pros and cons for each. Here at The Plan Collection we suggest that you select materials based on the look you’re after and the level of maintenance you’re willing to do to maintain the integrity of your deck or patio.